It’s not often that a film makes me totally speechless, but Spotlight did exactly that. The film tells the story of how the Boston Globe uncovered one of the largest abuse scandals in the catholic church, delving into the stories of both the victims and the journalists giving everything to find out the real truth. It’s hard-hitting stuff, but at the same time totally immersive – we find ourselves enraged by the scandal, yearning to know more. The complex subject matter only adds to the viewing experience, as Spotlight rapidly transitions from newsroom drama to newsroom thriller. Although not director Tom McCarthy’s first feature, its certainly the first that wider audiences will have heard of and if Spotlight is anything to go by, we can expect some fantastic films in the future! He creates an incredible amount of drama from such fine detail, conveying the scale and scandal of what is to be uncovered – just when you think the Spotlight team have hit the jackpot another revelation comes along and ups the anti; McCarthy’s direction makes the audience become desperate for it to stop, particularly as well learn more and more about the suffering of the victims and just hope it can’t get any worse (it does). Credit must also go to cinematographer Masanobu Takayanagi (Warrior, Silver Linings Playbook), there’s nothing overwhelmingly special about the film visually, but the simplicity of the shots allows the greatest amount of focus on the characters. In fact, Spotlight is a totally character-driven film and has a highly prolific ensemble cast to go with this. Michael Keaton, Rachel McAdams, John Slattery, Liev Schreiber, Brian d’Arcy James and Stanley Tucci all star and all deliver fantastic performances but Mark Ruffalo really stole the show for me. It’s hard to single someone out in a fantastic ensemble performance but Ruffalo stood out as portraying the most enticing character, desperate to find some sort of redemption or relief for the victims he came across. I would absolutely love for him to win the Best Supporting Actor award at this years Oscars ceremony although, despite his nomination, its looking unlikely. Spotlight is the kind of film that had to have flawless acting performances to be taken seriously and it has exactly that. Every character is well-developed and every character brings something different to the story. 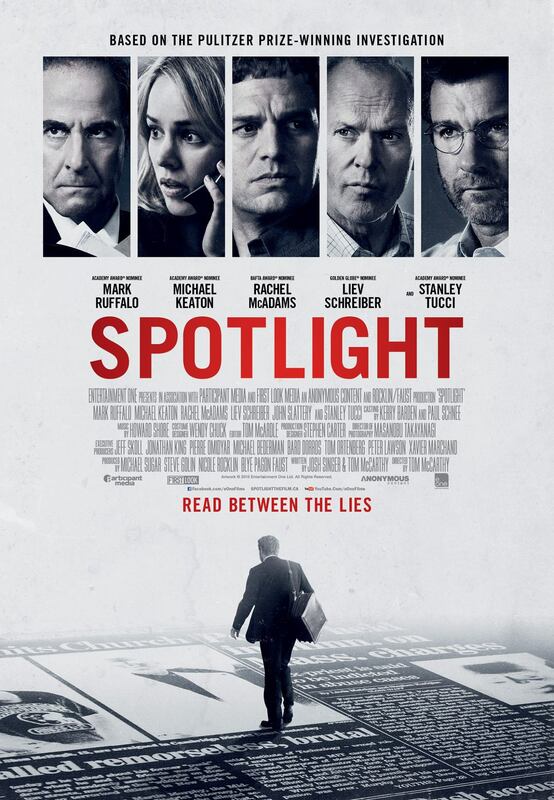 Spotlight is what I would call the ‘ultimate film’. It brings so many exciting ideas to the table and delivers them all so well that it would be my pick for Best Picture. Documents, newspapers and journalists have never been so enticing, nor have they ever been the provider of so many thrills. Admittedly, Spotlight might not be a stand out for everyone, but there is no doubt that its delivery of such harrowing subject matter and phenomenal acting performances should receive praise from all. If I were to recommend a Best Picture nominee, this would be it – and that’s saying something, because I absolutely love Mad Max: Fury Road. This entry was posted in Uncategorized and tagged film critic, film review, mark ruffalo, michael keaton, oscars 2016, rachel mcadams, spotlight, spotlight film, spotlight full movie, spotlight movie, spotlight movie review, spotlight review, tom mccarthy. Bookmark the permalink.